I can always use Free Target Money! Thank you for your generous weekly giveaways! I already like (love) this site on FB! My girls love temporary tattoos. Thanks for the giveaway! I love you guys! I would also love to win!!! I like you on fb under my Beverly S,,,,, account. Already a fan on Facebook!! I hope I win!! I love Target!! I ‘like’ you on FB!! I hope I get this(: This is my 1st post. Love the creepy crawlies…thanks for the chance! It would be wondeful to win! I love Target! Thank you for all the cool updates. 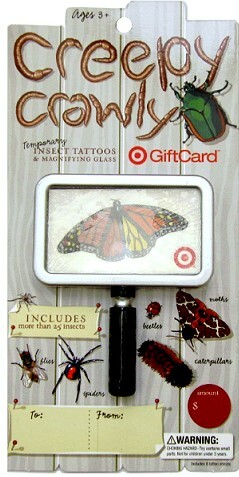 My daughter would love this and I love Totally Target! Another cool gift card giveaway–Thanks! Awesome gift card! Love to win it! Already like Totally Target on Facebook!! Thank you me and my family love Totally Target! “fine print on a coupon” LOL. You’ve been to my Target I see. So cool for spring you rock Totally Target! thanks for another great giveaway!!!!! My three little boys would love that giftcard! What a cool gift card. Thanks!